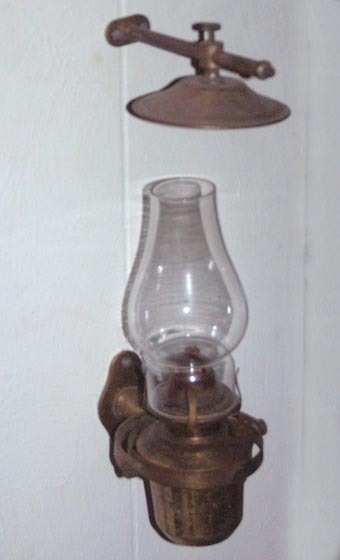 Also referred to as a Eureka, Sun or 'Prong' these burners were widely used in lamps of various sizes. Burners were made by many manufacturers over the years in differing qualities and with 3/8", 1/2", 3/4" and 1" wicks. This simple design of burner was manufactured from the late 1800's right up to the poor quality brassed tin versions still in production today. 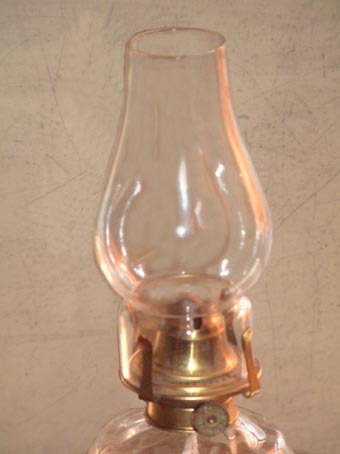 It was used in small wall lamps, hand lamps and decorative glass lamps. Though more forgiving if fitted with the wrong chimney the correct style of chimney will result in a cleaner, brighter burn. The correct chimney for this type of burner is the 'Comet' style, named because of the shape being similar to that of a comet flying through the sky..! There were many variations on the 'Comet' style for decoration or special applications. The most popular styles being the 'Tram' or 'Bulge', there were also short Comet, (used in ships lamps) and long Comet, (fitted to taller hand lamps). Sun burners were often fitted with a 'Pine' chimney which tapers up to the top rather than the 'Bulge' shape. Left is a burner fitted with a 'Tram' Comet chimney, the special design of this chimney directs the air inwards towards the burner giving a brighter, steadier flame. Tram chimneys were originally available in 2 1/16", 2 1/2" and 3" fitting but supplies are erratic these days and supplies can disappear for long periods. Left is a burner fitted with a 'Sun Lotus' chimney, the decorative top of this chimney complements the tall glass fount well, giving a balanced look to the lamp as well as good light. A gimballed ships lamp fitted with a Bulge Comet chimney. Some gimballed lamps have a 'Hinge' burner with a small screw on one side of the gallery. This type of burner should be fitted with the 'Hinge' chimney which has a small lip around the base for the screw to locate in and prevent the chimney from falling out in rough seas.